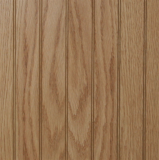 Readily Available in Oak, Maple, Cherry & 12 Other Species. 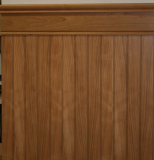 We have access to 15 species of decorative veneer faced plywood, MDF or particle board core. Although we mostly stock 4 x 8 sheets, we can supply various sizes and thicknesses. These sheets can be custom beaded or grooved as your project requires. With the current North American-wide wild fluctuations in pricing, exchange rates and stock shortages, we can no longer publish all our prices, please call or email. For volume discounts if you are looking for 20 sheets or more contact us. We're standing by, ready to help you choose the right product, determine how much material you really need, and coordinate safe delivery of your order. We carry lot of inventory, so delivery is fast, you'll get your order a few days later. We also offer cut to size sheets or boards, call for pricing. Sheets are best suited for transport shipping. One sheet of BEADED Stain Grade, Raw, Red Oak / Maple or Cherry veneered board, with the beads 2" on centre. Over 15 other species of hardwood are available by request.